Language is such a complex means of communication. It is also strange, beautiful, and capable of expressing so many perceptions in such creative ways. I am an avid reader and have an inherent appreciation for the descriptive and the poetic ways in which our thoughts, feelings, and experiances can be communicated. Every year my desk calendar features a word of the day and there always seem to be more words to learn. For example, did you know that there is a word for flirtatious conversation that leads nowhere? There is, it’s sphallolalia. Or that moment of hesitation just before you introduce someone because you’ve forgotten their name? The word for that is tartle. I also marvel at the way many languages have words for things that the English language does not describe, such as the German words kummerspeck and fremdschamen. The former is a word to describe the excess weight that one gains from emotional over-eating, and the latter literally means the horror that you feel when you notice that someone is completely oblivious to how embarrassing they are in a moment. The creativity of language is wonderful! Which is why when researching topics for this weeks blog I was shocked to find a language that uses only about 100 words in total. 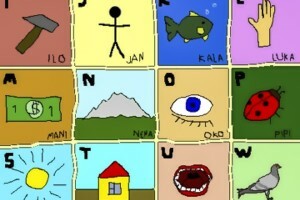 Toki Pona is the world’s smallest language. According to Roc Morin in his article for The Atlantic, the simplicity of the language creates a more profound form of communication (How to Say Almost Anything in 100 Words, 2015). Toki Pona contains 14 phonemes and 120 root words and is designed to shape the thought processes of it’s speakers in a Zen-like fashion. This is a miniscule Number of parts to work with considering there are a quarter of a million words in the Oxford English Dictionary and even Koko the gorilla has a 1000 different words that she can sign. Apparently Toki Pona is now utilized by thousands of people around the world from Belgium to Australia, to China, but was constructed fairly recently and was first published in 2001 by linguist Sonja Lang from Toronto. Her aim, it seems, in creating this language was to minimalize and simplify the spoken word to its most efficient and reductive form. The result of this carefully crafted language is that it is subjective to what an item or concept means to the speaker. It is a language of neologisms in a sense. In order to speak Toki Pona, one must determine what the word they wish to say means from their subjective point of view and construct a phrase. Morin uses the concept of a car to illustrate this. The speaker must determine what exactly a car is. Lang says: “You might say that a car is a space that’s used for movement,” she proposed. “That would be tomo tawa. If you’re struck by a car though, it might be a hard object that’s hitting me. That’s kiwen utala.”(2015). To create the Toki Pona, Lang used a sort of top- down method of reducing language to it’s most basic elements and figuring out what would be needed to express most anything with as few flourishes as possible. There are no words for thank you or please. There are no words for vague concepts like the color pink. As I was reading this article, I wondered what would be the point of creating a new language in such way and why you would want it to be so limited. But as I read on I realized that it was just another miraculous invention of expression. It’s the linguistic version of Modern furniture. It has clean lines and clear artistry. It can also be learned in 30 minutes or less! This entry was posted in Uncategorized on November 22, 2015 by Jamie Lucas. I found your post to be very interesting. I agree that language is a very complex; especially the English language. It seems that every day there is a new word that can be used in place of something else. With knowing this I was shocked to hear about Toki Pona only containing about 100 words. For a woman like me with a lot to say 100 words just does not seem to be enough. Lol. Then to hear that it is an easy to be learned only taking about 30 minutes was even more shocking. I was confused on how the language worked with just the explanation given in your post alone. How am I supposed to simplify such complex sentences into these simple sentences and still get my point across effectively? I even tried to google the language for myself and I am unsure if it was because I was trying to hard or maybe I just didn’t find the correct links but I do not think that Toki Pona is for me. However I guess in a society where less is more and if communication is low that you want to say what you have to say and go on with your day. I guess that is what is wrong with us Americans we have to make things more than what they are or what they need to be. I thoroughly enjoyed reading your blog post. I too, find the complexity of language so interesting. It’s amazing how quickly individuals can pick up languages. I watch my son, who is almost three, learn new words and form sentences every day – it is truly unbelievable to think that we are wired to learn languages. Being bilingual myself, there are similarities and differences between English and my second language, Korean. I find that often times, I’m rephrasing my words or trying to find the word for “xxxx” when I speak in one language over the other. I especially found your description of Toki Pona fascinating. It’s amazing that a language doesn’t need to be complex in order to be understood. This makes the language more widely accepted among all people. This was a very interesting post! In fact, I was not aware that there was a language that used such a few amount of total words! Like you stated, the language of Toki Pona involves only 100 words. I cannot personally imagine using a language that has a maximum of only 100 words, especially since, like you, I love to read and am fascinated by such intricate words that specifically describe an event, emotion, feeling, etc. I especially cannot imagine using a language without “please” or “thank you,” especially since these words were enforced very highly in my family and future generations. It is difficult to think how this “artistic” form of a language would be exciting to use (personally, for me) since I have learned to appreciate not only the basic every-day words in the English language such as “bird” or “chair”, but also the more specific and abstract words, such as “zephyr” and “triskaidekaphobia” (fear of the number 13!). I am entirely fascinated by each and every detailed word of our English language. I am especially fond of words like the ones you mentioned that explain even more detailed things or emotions that are not included in the English language, such as “kummerspeck” and “fremdschamen.” These words just never fail to fascinate me, and language and every detail of a language is such a beautiful way for humans to express themselves, actions, and feelings. Perhaps this type of language is similar to tribal languages, where they do not need specific words like “zephyr” or “triskaidekaphobia” for everyday life. Perhaps a language like Toki Pona would actually be more beneficial in these instances to get simple points across to each other. Here, the word “pink” may be unimportant for everyday survival, and “please” or “thank you” are not necessary. Very interesting post, nonetheless! My name is Falisha or Fee-li-cii-ahh? New Studies on Memory and Marijuana usage.